Click here to review previous issues or to view this issue using Google Translate. To review or print the meeting agenda and backup materials, go to PalmBeachTPA.org/meeting. Members of the public are encouraged to attend and will be given opportunities to comment. 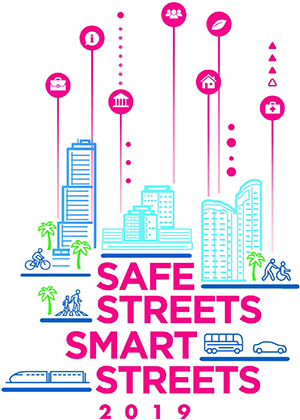 The largest ever Safe Streets Summit will take place for the first time in Miami-Dade County next week. Nearly 500 individuals invested in better connected and safer communities will gather for the 6th annual event. The conference day will feature former U.S. Transportation Secretary Anthony Foxx as the keynote speaker, along with other nationally-recognized speakers and leaders in Complete Streets to discuss the implementation of practical and replicable strategies to address safety, health, economic development, and local transportation challenges. The second day will feature multiple mobile workshops starting at the Brightline MiamiCentral Station. 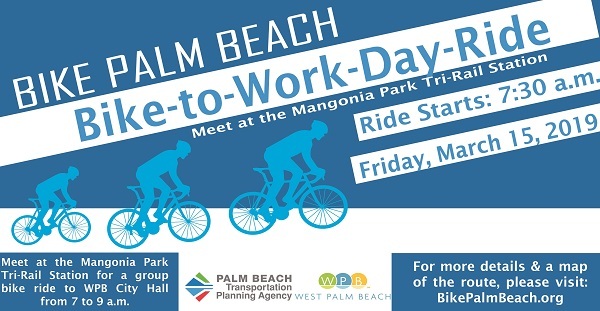 As has been the practice in past years, the Palm Beach TPA will coordinate a group bike ride into downtown West Palm Beach and will participate as an exhibitor in the City Hall courtyard to celebrate Bike-to-Work Day on Mar. 15. Click here for the details and route of the group ride from the north, coordinated by the TPA. Watch for upcoming details on additional group rides into downtown and related events for Bike-to-Work Week in West Palm Beach, Mar. 11-15. FDOT will host a Design Public Hearing on Thursday, Feb. 28, to discuss proposed modifications to State Road 710/Beeline Highway from Northlake Blvd. to State Road 708/Blue Heron Blvd. Click here to review details of the proposed project and listings of additional upcoming public meetings in FDOT District Four. 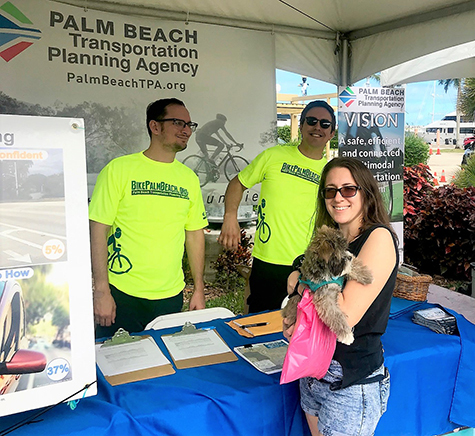 The Palm Beach TPA was an exhibitor at the City of West Palm Beach Vision Zero Safety Fair held on Feb. 9.